blend of other natural sweeteners. It's 100% natural with nothing artificial. This giveaway will end April 10th at Midnight EST. 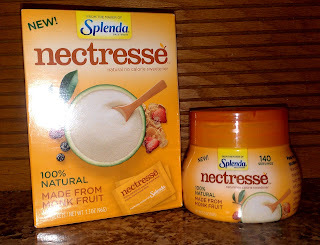 Disclaimer: I received complimentary zero calorie sweeteners from Nectresse for the purpose of writing a review and hosting a giveaway. Regardless, I only recommend products or services I use personally and/or believe will be a good fit for my readers. The views and opinions expressed on this blog are purely my own. Results may vary. No monetary compensation was received. I learned it is all natural, like stevia. I learned that Nectresse is made from an extract of monk fruit combined with erythritol, sugar and molasses. I learned that Monk Fruit is a round, green melon that grows on vines on remote mountaintops in central Asia. zero calories per serving! Awesome! I learned that it is made from monk fruit, which is about 150 times sweeter than sugar! It is all natural. ihope to try it soon! i learned its zero calories! I learned that the company is located in Fort Washington, Pennsylvania. Thank you for giving the information. I am too using such type of sweetener that is made from Stevia leaves which are good for health.